Padstow - For detailed information about overnight stops in Padstow before you start your South West Coast Path walk CLICK HERE to read the information which is covered in our Westward Ho! to Padstow section. Perfect for a rest day and without doubt the region's, best traffic free cycle trail, The Camel Trail, created on a disused railway line, provides safe, flat and incredibly scenic pedalling that everyone can enjoy from the coast at Padstow to the inland moors of Bodmin. Using recovered rail bridges, the track is fully maintained and signed giving a total of 18 miles of unforgettable trail that takes you through varied landscapes beginning with the coastal panoramas of the Camel Estuary from Padstow before heading inland into the idyllic woodlands and the wilder uplands outside Bodmin. Whether you explore the lovely estuary town of Wadebridge or the fascinating and rather gory remains of Bodmin Jail, you will come across cafes, restaurants and even the award winning Camel Valley Vineyard on route as well as the excellent Camel Trail Tea Garden where you can park the bike, sit in a shady glade and eat good food and drink without a car in sight. Teeming with wildlife, this tranquil trail has a multitude of idyllic spots to pull over and take in the unspoilt landscape and, with a handful of opportunities for refreshments on the way, a perfect days cycling is guaranteed. Traffic free and hassle free with easy hire options from Padstow, cycle hire is around £15 per day - So don't miss the opportunity to wave goodbye to the cars and roads and enjoy the best cycle only trail the region has to offer. The little village of Harlyn Bay sits on the edge of a lovely run of golden sands in the shadow of the dramatic headland of Trevose Head with its commanding lighthouse that stretches away into the ocean ahead. 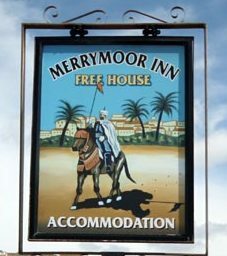 Overnights here are in The Harlyn Inn where you can enjoy good refreshments as you sit and watch the surfers. With a pint of “Doom Bar” in hand at the you can ponder that you are sitting on the site of a 5000BC Burial ground where over 200 crouched skeletons including 3 sacrificial offerings were unearthed, the bodies buried with frogs and mice which were thought to be good luck talismen. One big plus about staying here is you are right on the beach for a pre evening meal stroll OR for more energetic walkers arrive early and you can hire a surfboard or body board for an hour and join the locals playing in the waves. 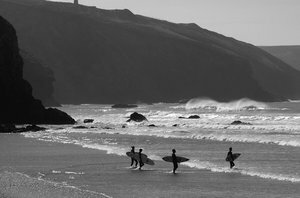 If you want a bit of instruction The Harlyn Surf School - one of the best on the North Cornwall coast is based here and you can get a quick lesson in surfing, go kayaking or even try the latest Cornish beach craze - stand up paddleboarding. All in all Harlyn is a great introduction to Cornish Beach Life - however if you want a break from the mighty ocean then just inland if you want a wander in that direction is St Merryn village with public houses, restaurants, bakery, post office, and newsagent - quite a coup in this part of Cornwall. A tiny cove with yet another glorious sandy beach. Porthcothan is a small hamlet that almost feels more like something from a laid back Australian Coastline with little more than sand, surf, a handy beach shop and a pub for your evening meals at The Tredea Inn - The pub whilst its not the prettiest building in Cornwall has one of the best views in the county from its huge outdoor decking construction set halfway up the hill inland of the cove - views back over Porthcothan Bay are superb. A great place to eat Al Fresco or just have a drink as the sun sets. Accommodation in Porthcothan is at one of two walker friendly B&B's - straightforward but in a lovely location though if you prefer to spend a second night in Padstow we can arrange to transfer you back there at the end of the walk from the Tredea Inn and bring you back here next day after breakfast so you can continue your walk and get another night of fine dining in the larger Harbour Town. For most however Porthcothan is a great contrast to its busy neighbour at Padstow and a quiet night in a small beach hamlet fits well at this point before the walk onto tomorrow nights stay in the largest town on the route at Newquay. Mawgan Porth is yet another stunning cove that shelters the walker from the headlands - a perfect crescent of sand sits below the low lying cliffs and rocky headlands at either side of the bay. 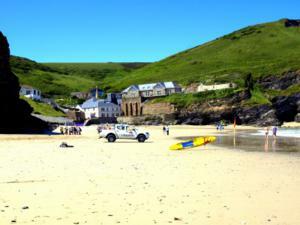 The Times newspaper rates it in its top ten UK beaches list and notes that "There are better-known and busier beaches in Cornwall, but few can match the raw beauty of Mawgan Porth"
Larger than the previous beach stops since Padstow Mawgan Porth has a couple of restaurant choices and The Merrymoor Inn which has the pick of the locations directly overlooking the sands. You will also find a newsagents, farm shop and small supermarket as well as King Surf surfing school and hire centre if you missed out at Harlyn Bay - or if you are now addicted ! 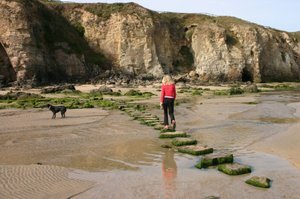 Watergate is the most spectacular beach on this section of the coast path with over two miles of golden sands, backed by caves and craggy cliffs. 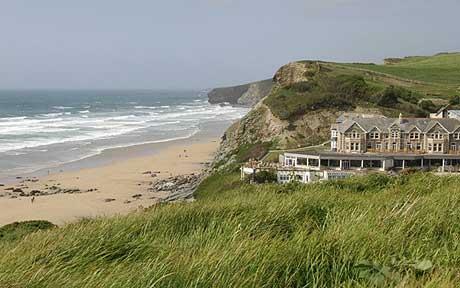 Watergate Bay is not the usual overnight stop on route to St Ives but for those who want to treat themselves, staying here gives you the opportunity of eating at Jamie Oliver’s acclaimed Fifteen restaurant, voted Restaurant of the Year for 2008 in the Sunday Times. The luxury Watergate Bay Hotel fully compliments the restaurant next door, squashily comfortable with contemporary decor and the most amazing views across the Atlantic Ocean. Just watching the kite surfers and other extreme sport junkies riding waves that have gathered momentum for thousands of miles is an exhilarating experience in itself. For those who want to join them, the Extreme Academy here can organise tuition and equipment so there is no need to sit on the sidelines, and where better to grab the opportunity of catching a wave than in one of the world’s top surfing destinations. 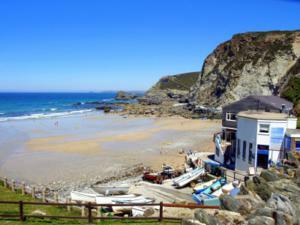 Watergate Bay can be built into your Padstow to St Ives itinerary, its not a cheap option but for that special night or rest day with some of the best activities, dining and accommodation in Cornwall just let us know and we can price this into your itinerary. 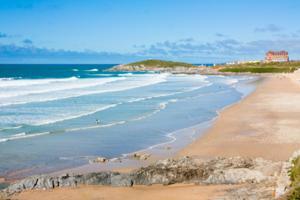 Newquay started life as a rather humble fishing village originally known as Towan (Cornish for dunes) Blistra. From 1554 silver mining brought a brief rush to the centre and its current name refers to a now not so “new quay” which was built in the 16th century. The arrival of the railway brought the Victorian trippers and ever since tourism has become the town’s main industry. A lively holiday resort the centre of Newquy comes with a good choice of facilities and entertainment but at times can be a brash and rather intense location, its clubs and bars attracting hen and stag night revellers in summer. For that reason we tend to use options for accomodation at Fistral Beach a good couple of miles beyond the town centre - still Newquay but instead of the nightclubs and bars you have one of Cornwall's finest beaches as the backdrop with a selection of quieter hotels. The choice on where to stay however is yours depending on what sort of evening entertainment you want ! Newquay itself is the largest town along the coast and as such has a good range of shops covering the essentials as well as boutique and indepenent curios - along with lots more wetsuit outlets of course. Whilst there are a lot of the usual rather forgettable tourist trappings, the town does has an excellent Aquarium with a walk through tunnel where you can watch sharks and turtles swim above you - well worth a visit as it sits on the main Town Beach just off the South West Coast Path. 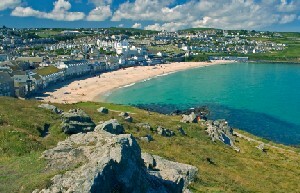 Newquay’s run of 9 excellent beaches form the capital of British Surfing and the town has developed its own unique surf culture and entertainment. Fistral beach is the last of the sands but without doubt the best - home to The Cribber a wave of up to 9 metres high that attracts the country’s top surfers as well as being the site of regular international competitions and surfing events. Golden Sands and huge waves have made Newquay the Cresta run of UK surfing and if you stay here everything from body boards to surfing lessons can be easily arranged at Newquay on a walking rest day. For those wanting a less intense swim head for sheltered Towan beach in the centre of town bordered by an impressive tall crag linked to the town by a replica of the Clifton Suspension bridge in Bristol. 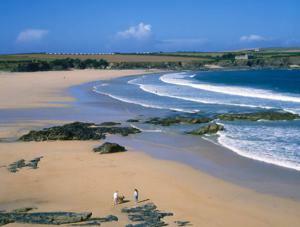 Just to the south of Newquay, Crantock is one of those secrets of the North Cornwall coast. The River Gannel has created a haven for seabirds and a place of tranquillity and this little community, was the original site of a large monastery mentioned in the Doomsday Book. Until the arrival of the railway in neighbouring Newquay, Crantock was the more important of the two settlements, trading vessels arriving below the settlement at Porth to offload their goods. 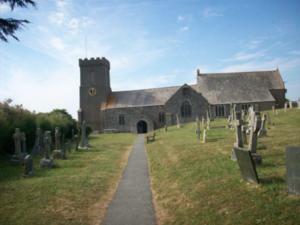 Its church is well worth a look over, its medieval stocks last used in 1817 are still in the churchyard and the village well, the thatched cottages and the Old Albion Inn, a notorious centre for smugglers (but now doing an excellent walkers evening meal !) 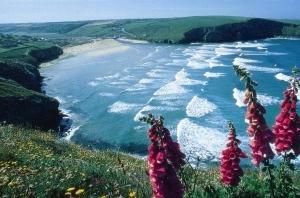 - all combine to make Crantock a pleasant place to stay. An evening stroll to the Bowgie Inn on the headland allows you to watch the sunset over the sands from the sun terrace with stunning views up and down the coast. As well as a couple of galleries / craft shops there is a tea garden and a holy well to rejuvenate the spirit before completing the West Pentire headland, a site of special scientific interest for rare seabirds and wild flowers. 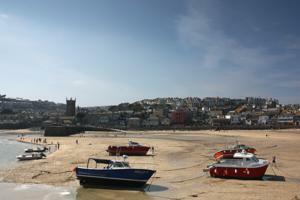 Perranporth’s name is inextricably linked with St Piran, Cornwall’s Patron Saint of Tin Miners. The Saint arrived on the towns golden Perran Sands having been thrown over a cliff by King Angus of Muster in Ireland tied to millstone. In rather miraculous fashion the millstone floated and brought St Piran over the Irish Sea to Cornwall. After landing on the sands St Piran made a fire to warm up and noticed a silvery liquid running from the stones below the flames…this was Tin and from this point onwards St Piran took up the mantle of the Cornish Tinner's and the many relics of engine houses on the cliffs around bear witness to this. 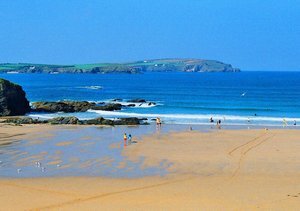 The beach at Perranporth is one of Cornwall's best loved with its huge wide perfect sands that seem to stretch into infinity - great for a pre dinner amble. Find stunning rock stacks at the south of the beach, a carved hermit cave in protected by a wooden door and a cliff staircase that takes you up to a magnificent sundial displaying Cornish rather than GMT Time ! Just to the north east of the village can be found the Piran Round an Iron Age hill camp where the amphitheatre would have been used for games and mystery plays. Many of today’s 21st century pilgrims head for the three miles of golden sands with every type of watersports from safe bathing to kite surfing on display. Several restaurants and pubs offer a wide choice of dinner from the laid back surf cool of The Watering Hole to the relaxed dining of St Georges Country Hotel. Anyone who has watched the television series, Poldark, won’t be surprised to learn that Winston Graham wrote his first book here, and the detective Wycliffe was also created here by author W J Burley who lived at Holywell Bay. With a great range of facilities for those coming off the coast path trail, if you overnight in St Agnes you will find yourself in the middle of a thriving Cornish Community, its heritage trail motto being Truly Friendly, Truly Cornish. Family Greengrocers and Butchers mix with a locally respected range of craft shops, galleries and workshops. There is a good choice of pubs along with cafes and restaurants to suit everyone’s needs. 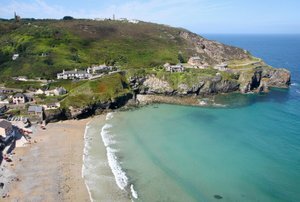 St Agnes boasts a dozen pubs and bars with as many restaurants, many of which serve local produce and freshly caught fish. It’s a pleasant town where you will still spot former miner's cottages and mine owners houses, as well as the charming sea Captain's cottages of 'Stippy Stappy'. The whole St Agnes area is a World Heritage Site and its mining landscape takes it place on a list including the Pyramids, the Grand Canyon and the Great Barrier Reef. To find out more there is a free entry museum here. The St Agnes Museum contains a fascinating array of artifacts and exhibits detailing the area's mining and seafaring heritage along with information and exhibits on all the local legends including St Agnes’sown Giant, Giant Bolster, who still plays a “BIG” part in village events. For a evening wander head down the hill to stunning Trevaunance cove a former harbour which also has excellent local amenities including a restaurant right on the beach. The Driftwood Spas Hotel is very happy to take walkers and we often place you here just above this stunning beach for the night. If you are taking a rest day here then surf board and wetsuit hire and surfing tuition can all be arranged here. 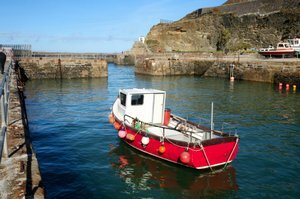 Coming in from the coast path you will find the appealing village of Portreath is spread along a stream valley running away from the beach up both sides of the valley. The centre of activity is situated around and behind its unusually narrow harbour, once one of the busiest ports in Cornwall shipping out copper ore and tin and taking in coal from Wales. Everything is nicely compact for walkers arriving on the South West Coast Path into Portreath. There are a handful of shops, cafes, pubs and licensed restaurants and the beach is a secluded expanse of sand and shingle ideal for swimming and surfing. Off shore the route to the harbour is signed by impressive Gull Rock. Stroll around the village to the south to spot the cannons of the Battery House that were here to counter any unwelcome French attack. Closer to the quay and close to the Coastguard lookout, find the Deadman's Hut the temporary mortuary for the many wreck victims that landed here. The original loading ramps of the port can still be seen from the village and some of the tramways used for transporting the ore from the mines by horse drawn wagons have now been made into excellent cycle paths. These paths connect to the Mineral Tramways route right across Cornwall offering a great off-road route (and a shortcut!) to reaching the South Coast near Devoran. 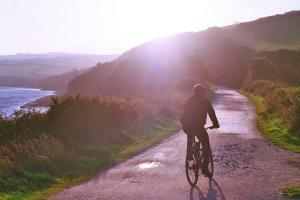 Bike hire can be arranged for anyone staying here for a day off the Cornish Coastal Path. If you fancy a dip look out for the remains of the local landowners saltwater bathing baths. These were cut into the rocks for bathing by the Bassett family at various different levels to allow for the tide - one was even inside a cave reached by a metal ladder. A larger seawater pool has been created in the rocks on the eastern end of the beach for those looking for a more sedate cooling off. The sand and shingle beach is a popular haunt for more advanced surfers – if you want to join them surfing gear can be rented here or if you fancy an evening stroll with a break from the coast, just over a mile’s walk inland is Tehidy House and Country Park, with a great range of trails and paths. A tiny and very attractive Cornish village with ancient origins, Gwithian is delightfully set in the Gwithian Towans an area of sand dunes grazed by free wandering ponies and bounded by the Red River, so named for the residues which used to flow through it from the mines upstream. The village itself backs onto the dunes and the first signs of a church, built by Gwithian, the patron saint of good fortune on the sea and one of the many Irish Saints who landed here, has been dated to 490 AD. This building was claimed back by the ever shifting sands, but parts of it have been incorporated into the lych gate of the present 15th century church. As an overnight stop there are several options for relaxation and refreshments, The Red River Inn is Victorian and provides good food with a constantly changing specials menu inside or in summer eat in the beer garden a stones throw away from the church. Just beyond the village at the start of the stunning towans the Sunset Surf Cafe is a laid back place to relax in at any time. To get involved in the “locals culture” you can also hire your surfing gear here. For sunset views head up here from the village after dinner and enjoy a panorama overlooking the whole of St Ives Bay and Godrevy Lighthouse, the inspiration behind Virginia Woolf’s story “To The Lighthouse” and a breeding ground for seals, guillemots, razorbills and cormorants. 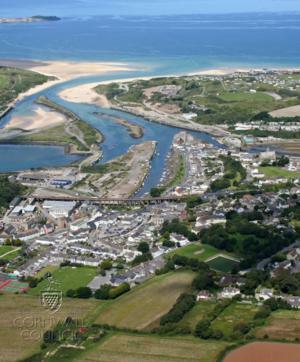 Hayle is one of Cornwall’s newer habitations arriving in the 18th C to grow to a major port on the North Coast with its sheltered harbour being a rare thing on this stretch of the county. Back in time however this area was on a route to St Michaels Mount dating back to the time the Phoenicians traded for tin over 2000 years ago. The 15th century Phillack Church is worth a look as you arrive, a small stone over the south porch is inscribed with a symbol of early Christianity and is believed to date to the 6th century. Perhaps more in order if you have travelled over the dunes the old pub next door is worth a visit, if only for its name “The Bucket of Blood” The name dates back several hundred years to one fateful day when the landlord went outside to draw water from the well. Pulling up the pail, he found the water to be bright red, as a corpse has been thrown down the shaft. The estuary itself is an important bird watching site, especially at the times of year when thousands of migratory birds gather here as a stopping off place. Much of the RSPB area of wetlands is easily within a short evening stroll from town and there are viewing hides for those who want to look for that rare visitor. For the tired walker Hayle has plenty of pubs and eating places are easy to find in the narrow streets. 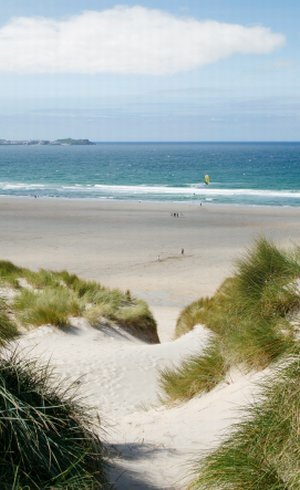 If you just want to wind down after dinner with an amble along the sands there are 3 miles stretching out of Hayle with stunning and reassuring views out over the blue waters to tomorrows destination end at St Ives. Nearly every visitor to Cornwall has heard tales of the beauty of St Ives and whilst this makes it popular destination, its rocky island head sanctuary beyond the town and the number of options for sandy beaches make it easy enough to get away from the crowds in high season. 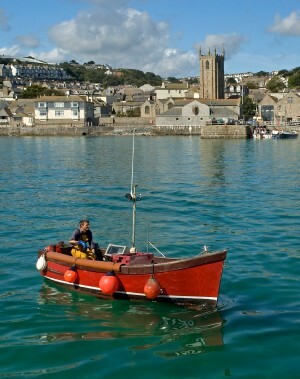 As a walker you get the best of it - breezing in during the afternoon as the day trippers leave - making use of the collection of Cornwall's best restaurants and most atmospheric harbour.... before heading out again next day on the trail as the next set of visitors arrive. Yes - beautiful, bustling and these days Cosmopolitan St Ives provides an excellent staging post for walkers preparing to head off into the wilds on the route to Lands End. For those walking the coast path West, this is pretty much the last time you will have much choice over your food and beds during the next 4 days. On the other hand for those arriving after 6 days of walking from Padstow, St Ives is perfect for that end of walk celebration, a welcoming host with its first rate food, relaxed atmosphere and stunning panoramas on the doorstep. If you can ditch that car and consider arriving or departing by train as you enter St Ives on a stunning branch line that rides high along the cliff edge to the town. 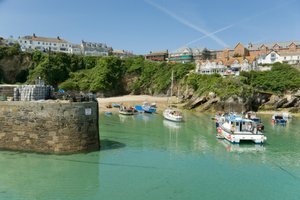 St Ives was named after an Irish Princess and Missionary, St Ia and has a past rooted in the humble pilchard – this was the most important pilchard port in the whole of UK in its day. Whilst fish are still landed here, these days it’s become famous as a haven for artists and lovers of art. You can visit the Barbara Hepworth Museum and Sculpture Garden and follow a trail of her work through town. The Tate Gallery of course has its own outlet here, an amazing space overlooking a spectacular rolling Atlantic beach. For those heading further west on the coast path the paintings here from the St Ives School are inspired by the very scenery you are about to enter. Even if you don’t visit the exhibition its worth stopping at the stunning rooftop restaurant and cafe. Throughout the town more galleries than you can shake a stick at are hidden down little narrow lanes with names like Teetotal Street, Salubrious Place and Mount Zion. 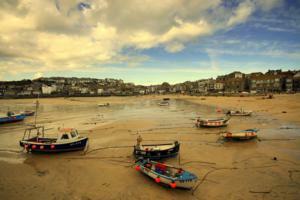 Much is made of the unique colour and light at St Ives which has drawn artists here for decades and the towns bustling streets, outdoor cafes and golden beaches do give it a strong Mediterranean feel. If you are resting between walks then many just head to the harbour area to watch the comings and goings from one of the cafe’s or take a gentle wander down Smeatons Pier with its huge embedded anchor and tiny Chapel to St Leonard used since medieval times as a place to pray for a safe return from the ocean. 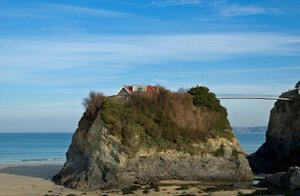 If you need a bit of space from the local art or want to enjoy a great sunset wander east onto the Island the little rocky headland that sits above the town, its a stunning spot with commanding views across the bay to the sands of Hayle and "Virginia Woolf's" lighthouse at Godrevy. The Town Museum is well worth a visit covering a wide range of Cornish Culture and History or for those looking for a bit more adventure take a morning surfing lesson under the nose of the Tate Gallery battling the rollers at Porthmeor Beach or just hire a body board and go ! St Ives provides a full range of accommodation with plenty of B&B’s as well as more upmarket hotels set back from the town and has a seemingly endless supply of excellent places to eat and drink. There is plenty here to warrant a two night stay before or after walking. For those who want to make the most of the culture come in September to be around during the 2 week St Ives Festival of Arts and Music or join in the anarchy of the annual hurling match through the towns streets in the April St Ives Festival .....but book your accommodation early.